The problem of billions of non-biodegradable plastic straws ending up in the world’s oceans has received much attention of late. 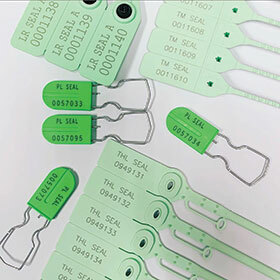 This prompted local security seal specialist, TruSeal, to investigate environmentally friendly options for its range of tamper-evident plastic security seals. “We use a lot of plastic in the security seal industry, the seals are used to secure moveable goods and high-value assets in several logistics-based industries, including the retail and supply chain environments. They are ubiquitous and, once used, have the potential to become an environmental nuisance if not properly managed,” says TruSeal director, Brent Cramer. “Currently, plastics only break down into smaller constituent parts. While saving landfill space, this has remained a source of concern for some time and so we’re pleased to have sourced a green solution to the issue of using once-off-use plastics, adding to the carbon footprint of several client industries,” explains Cramer. The new TruSeal product extension is produced from a special biodegradable material sourced from Malaysia. Once this material comes into contact with an environment like a landfill – or even a compost heap – where certain naturally-occurring microbes are present, it will begin to biodegrade. “This is an incredible solution to a burgeoning issue for our industry,” adds Cramer. 250 000 biodegradable security seals for delivery across South Africa in the first quarter of 2019. From this first green option, TruSeal will eventually phase in a biodegradable option across all of its product lines.